Jiva means life and Vrksa means trees. Combination says life giving trees. Definitely we are alive till the time there are trees on our planet. Similarly what if you get to use some skincare products, which are made using natural ingredients that are capable of giving life to skin. Today I will review JivaVrksa Personal Care Products. About Brand – JivaVrksa is a brand by Vrksa Lifespace Pvt Ltd. Brand name denotes health and their vision is to spread awareness on healthy and sustainable living through natural and organic products. Packaging – JivaVrksa products comes in simple pouch packaging. 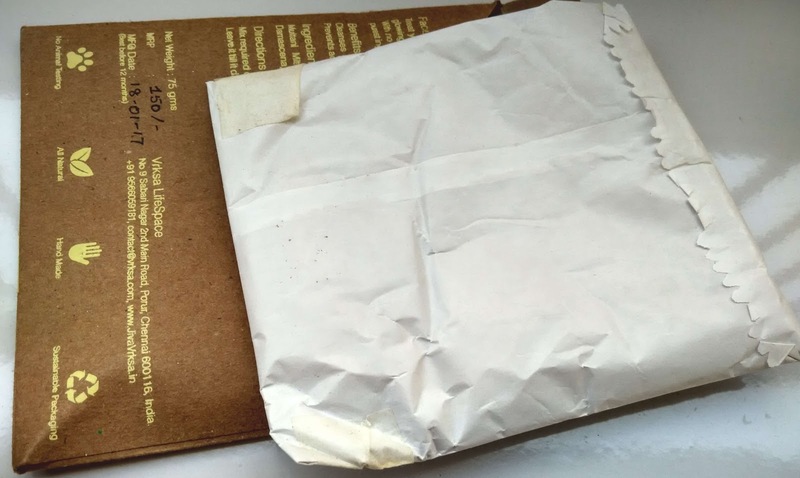 The only hitch with usage of these packs is that it’s difficult to store the product once it is opened. Since all four products are priced economically the packaging doesn’t really matter. All four products are enriched with rich natural ingredients. Sometimes you read lot of ways to create face wash, face masks at home. 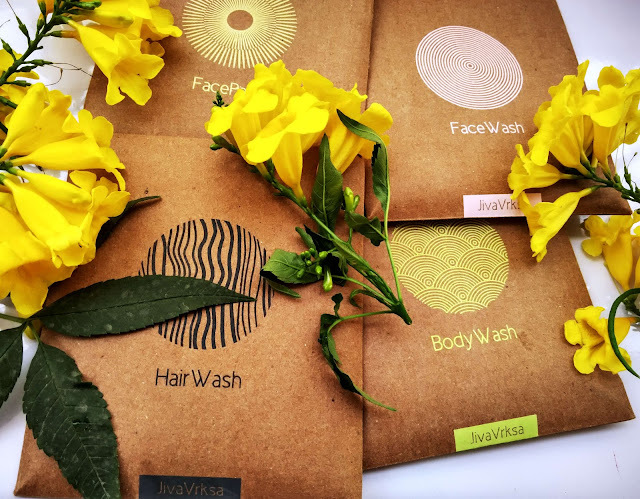 JivaVrksa has actually sensed that nerve and has created literally home-made personal care products and that to an economic price range of Rs. 80 to Rs. 150. Let’s review all these products one by one. 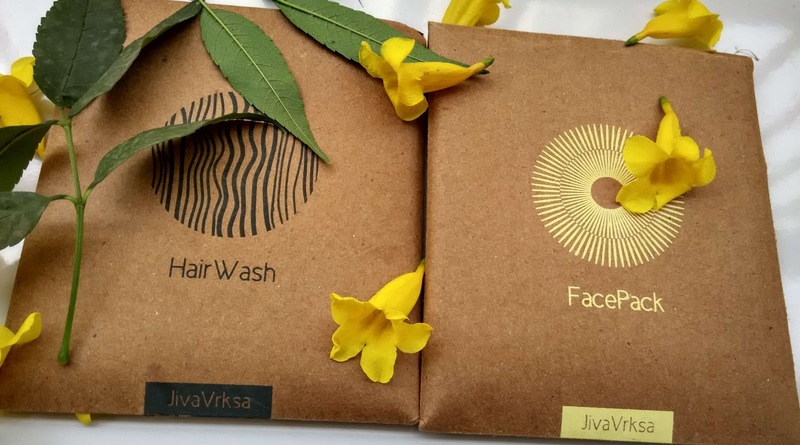 JivaVrksa Hair Wash Review – This hair wash is enriched with Shikakai, gooseberry, fenugreek, false daisy, orange peel and many more natural ingredients. One pack of 75gm is sufficient for two times use for medium length hair. I applied the paste using brush in my hair and left it for around 30 minutes and then washed it away. The hair wash was effective in cleansing my hair and I definitely used my regular conditioner after wash. I used hair wash in mid-week when I didn’t wanted to shampoo but had to clean hair to prevent any kind of foul smell. I was happy that JivaVrksa Hair Wash not only cleansed my hair well but also added natural scent to them. I am sure that if you will use this hair wash regularly your hair volume and length will increase. 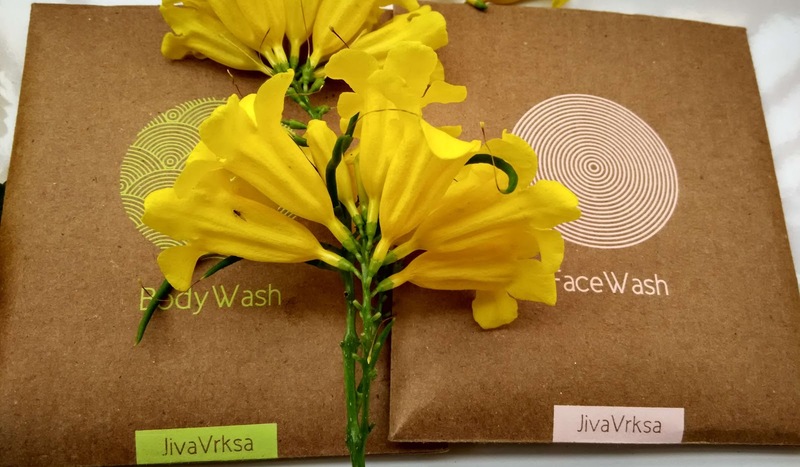 JivaVrksa Body Wash Review – The way to use this body wash is somewhat challenging and time taking. You actually have to form a paste, apply on skin and leave it for some time. You actually have to have few extra minutes while taking shower whenever you decide to use JivaVrksa body wash. But this body wash is amazing. The body wash cleanses skin naturally by making it smooth and tight. It is cooler to skin and in summers your skin will feel pampered and refreshing after bath from JivaVrksa Body Wash . JivaVrksa body wash is enriched with green gram, harde whole, nut grass, gooseberry. JivaVrksa Face Wash – This face wash and the way to use it is very different from any other face wash you have used till date. You have to pour out some face wash in a bowl, add some water to form thin paste. Then apply it by massaging all over your face and wash it away. You need some patience while using this face wash. I only use this on weekends when I have some time. But results on skin are awesome. Not only it cleanses my skin well but it also removes extra oil from skin and proves an effective face wash for acne prone skin. Jiva Vrksa face wash is enriched with chickpea, multani mitti (fuller’s earth), sandalwood, rose petals. JivaVrksa Face Pack – With goodness of multani mitti, sandal wood, orange peel and rose petals this face pack is great for improving skin tone. This face pack is effective in removing any kind of tan from your skin in just one time usage. The face pack is cooler to skin and smells good. Skin becomes cleanses, acne free, rejuvenated with its regular usage. Overall all four products are amazing. You don’t have to work hard on creating home made products when you have such available easily and so affordable.